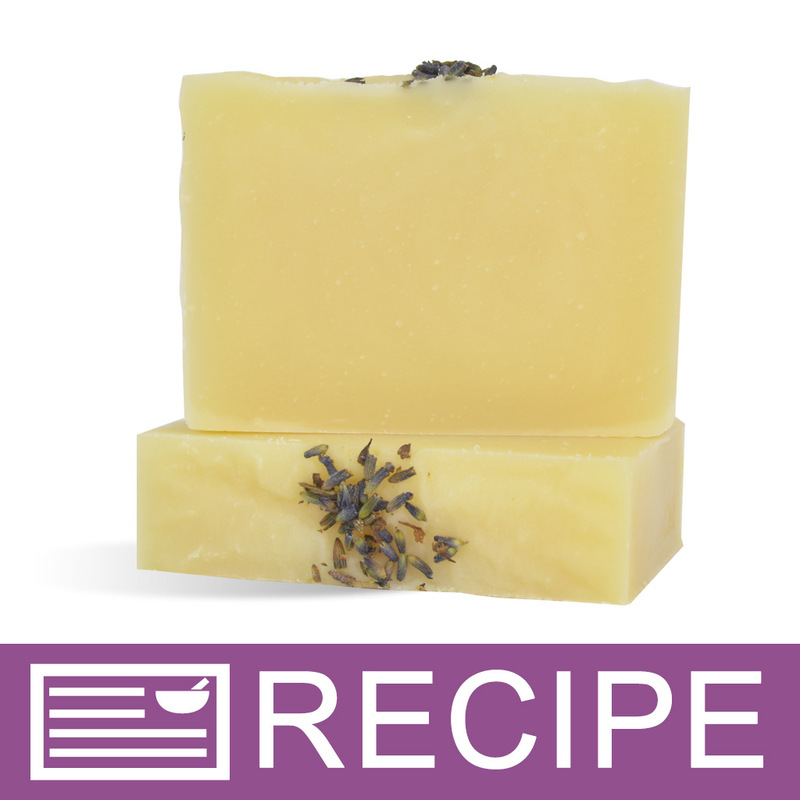 This beginner recipe is great for anyone just learning to make cold process soap. The lavender essential oil gives the final product a relaxing herbal and floral aroma. Sprinkling lavender buds on top is the perfect finishing touch! INCI Ingredient Label: Olive Pomace Oil, Water, Coconut Oil, Palm Oil, Sodium Hydroxide, Lavender Essential Oil, Lavender Flower. Prepare the lye solution by weighing the water and lye in two separate containers. Pour the lye into the water, carefully mix in a well-ventilated area and set aside to cool while you prepare your oils. Measure the oils and butters in the glass bowl and melt in the microwave. Set aside. In plastic beaker measure out essential oil and set aside. When both the lye mixture and the oils are 120° F or below, pour the lye mixture into the oils. Stick blend until you reach a light trace. Add the essential oil and mix by hand or with a few short bursts of the stick blender. Pour the soap batter into the mold and tap the mold on the counter to release any air bubbles. Texture top as desired and sprinkle top with lavender buds. Allow to set at least 24 hours or longer until soap is firm enough to unmold. Remove soap from mold and slice into bars. Let soap cure 4-6 weeks. Package and label accordingly. "can I sub the olive oil if I don't have it? if so for what oil?" Staff Answer Any changes to a CP recipe will need to be run through a lye calculator. You can substitute regular olive oil for the pomace but will still need to run it through the calculator. "I do not agree to using palm oil due to destruction of rain forest. What can be used in place of palm oil? 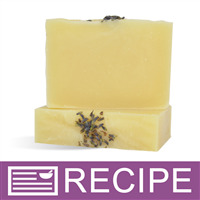 Thank you "
Staff Answer Here is a link to a CP recipe without palm oil: http://www.wholesalesuppliesplus.com/education/recipes/bamboo-teak-palm-free-cold-process-soap.aspx. We suggest researching different options for substitutes to see what suits your needs the best.